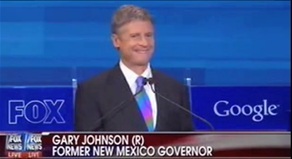 Aside from stealing Rush Limbaugh‘s joke, and stealing the show, former New Mexico Gov. 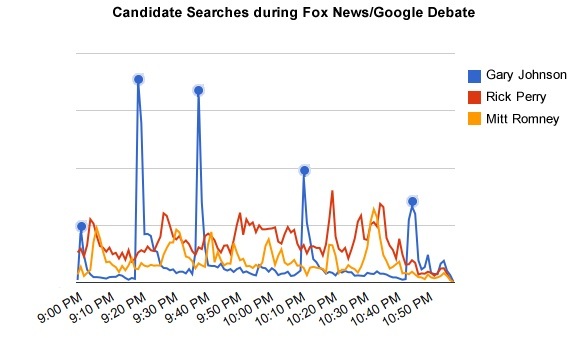 Gary Johnson also stole Google users’ hearts during Thursday night’s Fox News/Google Republican Presidential Debate. Until now an under-the-radar joke, the libertarian-leaning GOP hopeful made the most of his infrequent airtime during the debate, and his crowd-pleasing answers (plus his borrowed line of the night) seem to have connected with debate viewers, according to search data released by Google. Ironically, Johnson’s big laugh line, toward the end of the debate, spurred the smallest number of searches, as Google’s blog points out. Although the quip, that his “next-door neighbor’s two dogs have created more shovel-ready jobs than this current administration,” got all of the media attention, Johnson’s debate responses earned him consistently positive reactions from the debate audience. It stands to reason that a barely-known candidate like Johnson would generate searches, but the intensity that this chart illustrates could bode well for Johnson. Time will tell whether this translates into some kind of polling bump for Johnson, but his performance at the debate will at least elevate him above a blip on the media’s radar. Other nuggets from Google’s debate data set: Herman Cain’s 9-9-9 plan sent viewers scurrying to their laptops every time it was brought up; Mitt Romney won the book search-off against Rick Perry, as searches for his No Apology outpaced those for Perry’s Fed Up; and finally, Republican debate users overwhelmingly voted that the government department they’d most like to do away with is the Department of Education. You can see the full data set here.